The He Man second dude, who is the king of Wisconsin hunting, has decided that as long as he keeps introducing gun bills, he never has to follow the rules. 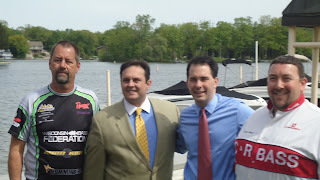 Meanwhile, crazy Joel Kleefisch, Blinky’s tubby hubby, paid a $243 fine earlier this year after pleading guilty to failure to register wildlife he slaughtered in the unit of kill. Ticket can be seen here! In all seriousness though, hunting is Joel's passion(if you check his facebook out, it appears to be all that he does,all day everyday) yet he does not even understand the rules in the one thing he loves the most. How and why in the world would anyone vote for him to try and fix our state and deal with important complex issues? In Caucus is he like a first grader, sitting on high school calculus?